Ryan and Sabrina join in | What moves you? Having arrived in Bangkok on the morning of January 10, Sabrina and I(Ryan) prioritized sleeping and eating above all else. Well fed and well rested, we met up with Michele and Caleb when they arrived in Bangkok on the 14th. Bangkok is the launching pad for what will be an 8-12 month journey to new places and exposure to societies different than our own. 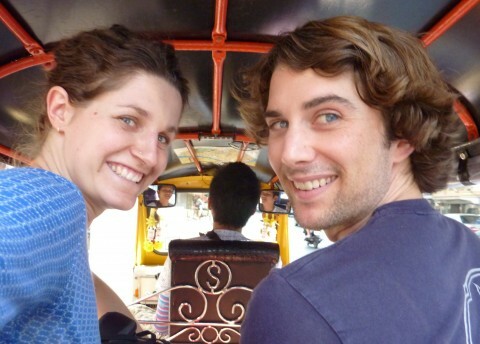 Michele and Caleb are beginning what I suppose can be considered the second phase of their journey following two months of travel through India and Bangladesh. It will take time for Sabrina and I to get into our travel ‘groove’ no doubt, while Michele and Caleb will certainly require a bit of readjustment from their established dynamic as a pair. From Bangkok we will make a short flight to Yangon, Burma/Myanmar where we will spend four weeks moving about in a society more closed off from the rest of the world than any of us have experienced before. We will then make our way via Bangkok towards Chiang Mai, Thailand and the surrounding borderland areas, where many Burmese refugees and organizations working on the ‘Burma issue’, reside. Here we will reflect on and compare observations and perceptions from inside Burma to life outside Burma and along the border. We will then travel together through Laos, Cambodia and Indonesia. It’s hard to imagine parting ways at the end of April and to determine our follow-on destination. However, for now we need not worry. Sabrina and I simply want to introduce our arrival on the blog and express our excitement for the months ahead with Michele and Caleb in Southeast Asia. We invite you to also take a look at our ‘about’ page, where we have now posted a little bit about ourselves and our expectations for the year ahead. I just want to say “Thanks” once again for your helpful informations about Burma and now i wish you a very nice time there. What a wonderful way to live! Right now it does feel like a way of life, you are so right. And such a rewarding one! Having and taking the time to respond to the countless “Hello! Where you from?”, “Your name?”, “Where you going?” we were rewarded with everything from finding out people’s football allegiance (95% Manchester United but Bayern Munich was liked, too) to being invited for incredible meals – like long lost family. Working life makes it hard to prioritize such intentional human interaction but my brain is working hard to figure out a way of doing it. Let me know if you or Robin have any ideas…you two probably more than anyone else I know seem to have found a way to make it happen.